VHGA – Promoting the sport of soaring foot-launchable aircraft in Vermont and adjacent New England states. 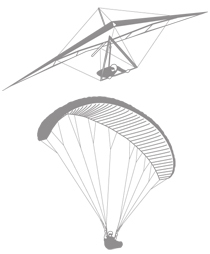 The Vermont Hang Gliding Association is a public-benefit non-profit organization that promotes the sport of soaring foot-launchable aircraft in Vermont and adjacent New England states. We work with government agencies, corporations, and private individuals to insure and regulate flight activities at multiple sites in New Hampshire and Vermont. We are a registered chapter of the United States Hang Gliding and Paragliding Association, the national self-regulating body for our sport. N facing ski mountain. Well known for smooth evening wonder wind flights. NW & S launches, premier cross-country flying site. With E, ESE, ENE launches, this high mountain site offer excellent XC flying.